Objective To assess the effect that accreditation training in fetal growth surveillance and evidence-based protocols had on stillbirth rates in England and Wales. Design Analysis of mortality data from Office of National Statistics. Setting England and Wales, including three National Health Service (NHS) regions (West Midlands, North East and Yorkshire and the Humber) which between 2008 and 2011 implemented training programmes in customised fetal growth assessment. Population Live births and stillbirths in England and Wales between 2007 and 2012. Results There was a significant downward trend (p=0.03) in stillbirth rates between 2007 and 2012 in England to 4.81/1000, the lowest rate recorded since adoption of the current stillbirth definition in 1992. This drop was due to downward trends in each of the three English regions with high uptake of accreditation training, and led in turn to the lowest stillbirth rates on record in each of these regions. In contrast, there was no significant change in stillbirth rates in the remaining English regions and Wales, where uptake of training had been low. The three regions responsible for the record drop in national stillbirth rates made up less than a quarter (24.7%) of all births in England. The fall in stillbirth rate was most pronounced in the West Midlands, which had the most intensive training programme, from the preceding average baseline of 5.73/1000 in 2000–2007 to 4.47/1000 in 2012, a 22% drop which is equivalent to 92 fewer deaths a year. Extrapolated to the whole of the UK, this would amount to over 1000 fewer stillbirths each year. Conclusions A training and accreditation programme in customised fetal growth assessment with evidence-based protocols was associated with a reduction in stillbirths in high-uptake areas and resulted in a national drop in stillbirth rates to their lowest level in 20 years. Analysis of national and regional Office of National Statistics data helped to avoid random variation due to small numbers at unit or Trust level and allowed trends to become apparent. Only total figures were available but previous regional subgroup analysis was able to pinpoint the downward trend in stillbirth rates as due to fewer deaths with intrauterine growth restriction. The study was observational but there have been no other regional or national initiatives which could have accounted for the reduction in stillbirths over this period, suggesting that the associations observed were causal. Training was instituted from 2008 through a series of bespoke accreditation workshops with hands-on teaching and assessment, and the promotion of evidence-based protocols and best practice guidelines.19–21 The rolling workshops were offered as a free programme to Trusts in the West Midlands, and were also held on invitation in interested Trusts in other regions. Evaluation through a test with MCQs and short answers including scenarios. Fortnightly accreditation workshops were commenced in 2008 at the West Midlands Perinatal Institute in Birmingham and were attended by midwives and midwife trainers as well as ultrasonographers and junior and senior obstetricians. The training was also available to staff from Trusts in other regions, through central or locally arranged workshops. Trusts which had accreditation workshops during 2012 were not considered ‘trained’ in this analysis of pregnancies which delivered up to 2012. Data on live births and stillbirths were derived from the Office of National Statistics (ONS) mortality statistics release for 201222 and previous releases from 2007 onwards.23 All data were fully anonymised and included stillbirths from 24 weeks gestation. Stillbirth rates were presented for single year as well as 3-year moving averages to smooth out short-term fluctuations and highlight longer term trends. Trend analysis was undertaken using standard χ2 trend test with 1 degree of freedom. Least-squares linear regression was used to obtain the slopes for the stillbirth rates of each region. Eighteen of the 19 maternity units, representing 14 of the 15 hospital Trusts in the West Midlands, implemented the GROW software and training programme, and the fortnightly workshops resulted in over 2000 staff being trained between 2008 and 2011. In the whole of England and Wales, staff in 46 of the 148 Trusts (31.1%) received accreditation training, resulting in 27.6% of all pregnancies during this period being cared for in units with trained staff (table 1). However, there was wide variation in uptake. In three regions (North East, Yorkshire and the Humber and West Midlands), on average, 78.5% of pregnancies (range 57.6–92.9%) were cared for in units which had GROW training, while this average was 12.0% (range 0–23.8%) for the rest of England and Wales (table 1). GROW accreditation and protocol training programme—uptake in Trusts in England and Wales, 2008–2011. Percentage of births in high uptake regions (>50%) marked in bold. Table 2 lists births, stillbirths and stillbirth rates from 2007 to 2012 for English regions and Wales together with trend analysis. There was a significant fall in stillbirth rates over this period in England (p<0.03) but not in Wales (p=0.7). Among English regions, only the West Midlands had a significant downward trend (p<0.01) and if this region is excluded, the drop in England becomes non-significant. The two other regions which were high GROW accreditation areas, North East and Yorkshire and the Humber, each showed downward trends in stillbirth rates which, when taken together, also reached statistical significance (p<0.03). These three regions were the only ones which achieved a negative (downward) slope of –0.10 or lower (West Midlands: –0.20; North East: –0.15; Yorkshire and the Humber: –0.11; table 2). 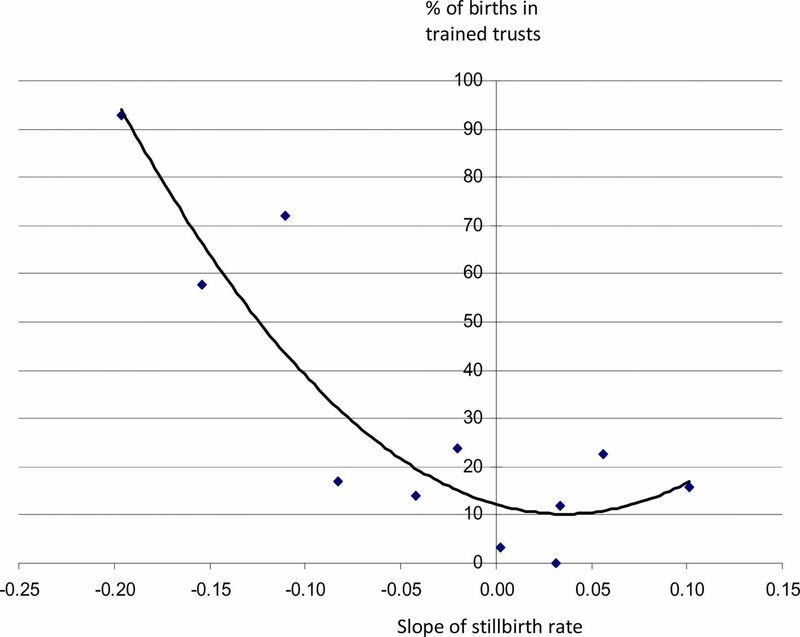 The training uptake rates in the regions were significantly correlated with negative slopes of stillbirth trends in table 2: R=−0.82, p<0.01 (figure 1). The year-on-year stillbirth rate for the three high-uptake regions is compared graphically with the remaining, low-uptake regions in figure 2. Total births, stillbirths (SBs) and SB rate (per 1000) in England, English regions and Wales 2007–2012. Values in bold indicate significant trend tests. Correlation between stillbirth trends 2007–2012 in English regions and Wales (table 2) and proportion (%) of pregnancies cared for in units with GROW training (table 1). Regression line: R= −0.82, p<0.01. Yearly stillbirth rates in the three regions with high uptake of GROW training and protocols (‘high uptake’) vs the rest (‘low uptake’), 2008–2012 (see table 1). Analysis of trend: high uptake, p<0.01; low uptake, p=0.9. In table 3 and figures 3 and 4, 3-year moving average stillbirth rates are listed for high-uptake and low-uptake regions of the accreditation programme. 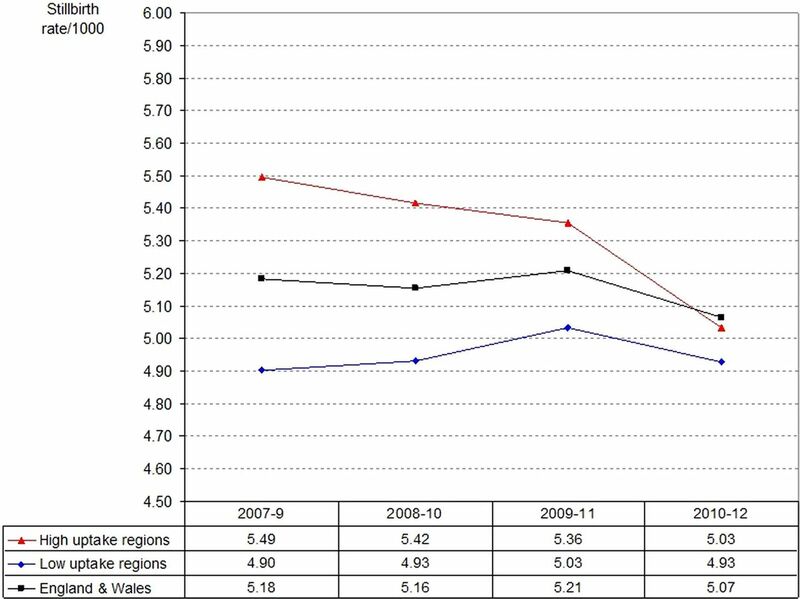 Each of the high-uptake regions displayed a downward trend (figure 3), while stillbirth rates in the other regions and Wales remained stagnant (figure 4). The moving average rates in high-uptake and low-uptake regions are compared in figure 5, demonstrating that the drop in stillbirths in England and Wales was achieved by the three regions with high uptake of GROW training. Stillbirth rates in regions with high uptake of GROW training and protocols, 2007–2012 (3-year moving average). Stillbirth rates in regions with low uptake of GROW training and protocols, 2007–2012 (3-year moving average). Stillbirth rates in high and low uptake regions and England and Wales, 2007–2012 (3-year moving average). This is, to our knowledge, the first analysis of national and regional stillbirth trends and their association with a training and accreditation programme. It indicates that stillbirth rates have dropped in regions with high levels of training (West Midlands, North East, Yorkshire and the Humber), while they stagnated in regions with low uptake. The downward trends in these three regions resulted in a drop in the national stillbirth rate to its lowest level since the current ONS stillbirth definitions were introduced in 1992, even though together, these regions account for less than a quarter of births in England (172 429/697 598=24.7%; table 1). Fetal growth surveillance in the UK is a multidisciplinary task and requires collaboration between community and hospital midwives, general practitioner, ultrasonographer and obstetrician or maternal-fetal medicine specialist. Care usually starts with the community midwife, who within the NHS is usually the first to see the expectant mother. Her assessment of whether the woman is of low or high risk will initiate the relevant care pathway. For mothers at an increased risk of intrauterine growth restriction because of obstetric history or other risk factors, or where fundal height measurement is difficult, for example, due to a maternal body mass index of 35 or more, serial third trimester scans are indicated.19–21 The current weak link in the referral chain is the chronic shortage of sonographers and ultrasound services in the NHS, which can manifest in several ways: referral on the basis of fundal height measurement may be unduly delayed or ignored; or the scan may be refused because of the frequently heard claim that ultrasound biometry at term has less accuracy—a claim which is in fact not supported by evidence.35 Furthermore, case note audits have shown that most of the pregnancies with an indication for serial ultrasound scans receive only one scan in the third trimester,13 resulting in detection rates no better than that obtained in pregnancies which receive no scan at all. Preliminary evidence suggests that antenatal detection in increased risk pregnancies can be improved with a policy of four three-weekly scans in the third trimester, up to and including term.36 Enhanced ultrasound scan policies can be cost-neutral when accompanied by implementation of customised charts, as their use for plotting fundal height measurement15 and estimated fetal weight18 will reduce false-positive diagnoses of ‘small-for-gestational age’ and referrals for unnecessary investigations. As shown in table 2, crude baseline stillbirth rates vary considerably between regions; they are likely to be related to characteristics of the population including social factors, ethnic mix and differences in congenital anomaly rates. Our analysis does not seek to compare the rates in different regions, but assess year-on-year trends and relative change. Two of the three regions with high uptake in GROW training had above average stillbirth rates at the beginning of the study period. As figures 2 and 3 demonstrate, the drop in stillbirths in these regions has contributed to a reduction in regional inequalities. Another potential criticism of our study is that confounders could have been responsible for the findings. However, we are not aware of any other recent or current major initiatives which could have accounted for the reduction in stillbirths over this period, either nationally or in the regions with the observed downward trends. Our study was observational and looked at the effect of voluntary engagement in a training and protocol programme. While a randomised trial design is usually considered the gold standard, it is not likely to be practical in this field, neither in terms of the power and sample size required when assessing the effects on relatively rare outcomes, nor in the equipoise needed for withholding training and implementation of already established, evidence-based guidelines. An examination of the nine criteria by Hill38 to establish causality demonstrates that each criterion is fulfilled (table 4), including that of temporality emphasised by Rothman.39 While Hill38 acknowledged that neither of his criteria represent indisputable evidence for or against a cause and effect hypothesis, they do help to determine “…whether there is any other answer equally, or more likely than cause and effect.” The evidence here suggests that the association between the intervention (accreditation training and implementation of evidence-based protocols) and outcome (reduction in stillbirth rates) may indeed be causal. The argument that this relationship is likely to be causal is strengthened further when examining the associations between stillbirth trends and time and effort. In the North East, GROW accreditation training was adopted between 2008 and 2011 by the majority of Trusts, and was facilitated by the preceding strong promotion of the 2002 RCOG guidelines19 by the region's lead unit in Newcastle. 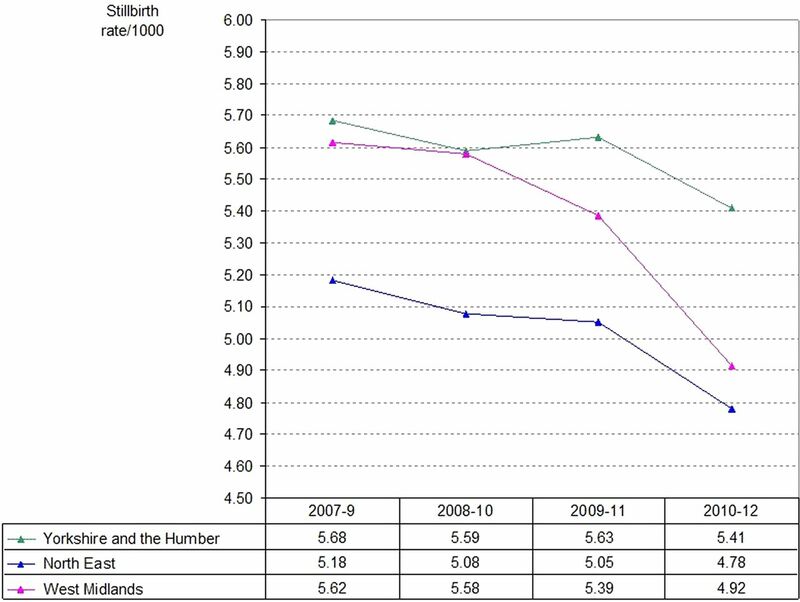 The 3-year moving average graph (figure 3) shows a gradual drop accentuated in the last triennium, with the 2012 stillbirth rate (3.91/1000) being the lowest ever recorded for the region (table 2). In Yorkshire and the Humber, all units participated in 2011 in a ‘train the trainer’ programme and developed a regional ‘best practice’ competency document based on the Perinatal Institute's protocols and training tools, which were administered through midwifery supervision. The ensuing year, 2012, saw a drop in stillbirth rates to 5.00/1000 (figure 2), the lowest recorded for the region to date. In the West Midlands, the introduction of the GROW accreditation programme in 2008 was complemented by regionally agreed protocols for scanning high-risk pregnancies, and were from 2008 to 2011 supported by augmented ultrasound resources in Birmingham, Stoke on Trent and several other areas. In addition, a data collection programme reported quarterly on antenatal detection rates of small for gestational age birth weight as a regionally agreed key performance indicator. The Region's stillbirth rates dropped year on year, with the 2011 rate falling for the first time in 50 years to below the national average.37 This fall continued in 2012 to 4.47/1000 (table 2), which is 1.26/1000 or 22% below the preceding (2000–2007) ONS regional average of 5.73/1000, and was equivalent to 92 deaths in the West Midlands. A similar rate reduction applied to the more than 800 000 annual deliveries in the UK would result in over 1000 fewer stillbirths each year. While this analysis focuses on English regions and Wales, stillbirths are a global problem, with the overwhelming majority occurring in low-income and middle-income countries.40 Global trends in stillbirth rate reduction lag behind progress in reducing maternal mortality and deaths in children under 5 years.40 Prevention will need to consider fundamental local needs, including provision and access to basic maternal and child health services and intrapartum and emergency care. However while these challenges are of a different order of magnitude, fetal growth restriction is also a universal concern, and the obstacles to improvement are in principle not dissimilar to those encountered here: insufficient awareness of the importance of fetal growth, lack of protocols, staff and equipment and the use of inappropriate growth standards, often imported from high-income countries. Recent work has started to address the need for international standards which are also individually customisable, or at least adjustable to the average characteristics of the local population.41–43 It is hoped that mounting awareness in high-income settings of the avoidability of many stillbirths will also help to enhance global prevention strategies. Our findings suggest that many stillbirths are not only avoidable, but have in fact been avoided, in the Trusts which adopted standardised training and evidence-based protocols for identification of fetuses at risk due to fetal growth restriction. We suggest that commissioners and providers should give high priority to ensuring that implementation of such a programme becomes an integral requirement for safe antenatal care, and is monitored by antenatal detection rates of fetal growth restriction as a key indicator of the quality of the service. The NHS Outcomes Framework 2012/13, Department of Health, London. http://www.dh.gov.uk/prod_consum_dh/groups/dh_digitalassets/documents/digitalasset/dh_131723.pdf (accessed 31 Aug 2013).
. Clinical implications of ‘unexplained’ stillbirths. (Commentary) In: Maternal and Child Health Research Consortium, ed: CESDI 8th Annual Report. Confidential Enquiry into Stillbirths and Deaths in Infancy, 2001:40–7. http://www.pi.nhs.uk/pnm/CESDI%20SB%20commentary.pdf (accessed 31 Aug 2013).
. Classification of stillbirth by relevant condition at death (ReCoDe): population based cohort study. BMJ 2005;331:1113–17.
. Restricted fetal growth in sudden intrauterine unexplained death. Acta Obstet Gynecol Scand 2004;83:81–7.
. Stillbirth and fetal growth restriction. J Matern Fetal Neonatal Med 2013;26:16–20. Confidential enquiry into stillbirths with intrauterine growth restriction—West Midlands Perinatal Institute 2007. http://www.pi.nhs.uk/rpnm/CE_SB_Final.pdf (accessed 31 Aug 2013).
. Maternal and fetal risk factors for stillbirth: population based study. BMJ 2013;346:f108.
. An audit of the detection and management of small-for-gestational age babies. Br J Obstet Gynaecol 1986;93:212–16.
. Antenatal care as a screening tool for the detection of small for gestational age babies in the low risk population. J Obstet Gynaecol 1996;16:77–82. Birmingham Fetal Growth Audit. West Midlands Perinatal Institute, 2007 http://www.pi.nhs.uk/ultrasound/Birmingham_FGR_Audit_-_Summary.pdf (accessed 31 Aug 2013). GROW (Gestation Related Optimal Weight) software version 6.5 (UK). Gestation Network. 2012. http://www.gestation.net/GROW_documentation.pdf (accessed 31 Aug 2013).
. Controlled trial of fundal height measurement plotted on customised antenatal growth charts. Br J Obstet Gynaecol 1999;106:309–17.
. Audit of fundal height measurement plotted on customised growth charts MIDIRS Midwifery Digest 2006;16:341.
. Serial plotting on customised fundal height charts results in doubling of the antenatal detection of small for gestational age fetuses in nulliparous women. Aust N Z J Obstet Gynaecol 2012;52:78–82.
. Reduction of false-positive diagnosis of fetal growth restriction by application of customized fetal growth standards. Obstet Gynecol 1996;88:844–8. Royal College of Obstetrics and Gynaecology Green-Top Guidelines. The investigation and management of the small-for-gestational-age fetus. 2002, 2013. http://www.rcog.org.uk/womens-health/investigation-and-management-small-gestational-age-fetus-green-top-31 (accessed Aug 2013).
. Intrauterine growth restriction: new concepts in antenatal surveillance, diagnosis, and management. Am J Obstet Gynecol 2011;204:288–300.
. Fetal growth screening by fundal height measurement. Best Pract Res Clin Obstet Gynaecol 2009;23:809–18. Death Registrations Regional Statistics 2012. ONS, 2013. http://www.ons.gov.uk/ons/publications/re-reference-tables.html?edition=tcm%3A77-314473 (accessed 31 Aug 2013). Perinatal and infant mortality 2007. Health Statistics Quarterly, ONS, 2008. http://www.ons.gov.uk/ons/rel/hsq/health-statistics-quarterly/no--39--autumn-2008/health-statistics-quarterly.pdf (accessed 31 Aug 2013).
. Customized birth weight centiles predict SGA pregnancies with perinatal morbidity. BJOG 2005;112:1026–33.
. Customised birth weight standards accurately predict perinatal morbidity. Arch Dis Child Fetal Neonatal Ed 2007;92:F277–80.
. Perinatal outcome in SGA births defined by customised versus population-based birth weight standards. BJOG 2001;108:830–4.
. Cerebral palsy and restricted growth status at birth: population-based case-control study. BJOG 2008;115:1250–5.
. The association between customised small for gestational age infants and preeclampsia or gestational hypertension varies with gestation at delivery. BJOG 2007;114:478–84.
. Doppler ultrasonography in high-risk pregnancies: systematic review with meta-analysis. Am J Obstet Gynecol 1995;172:1379–87.
. Does antenatal identification of small-for-gestational age fetuses significantly improve their outcome? Ultrasound Obstet Gynecol 2005;25:258–64.
. Antenatal care, identification of suboptimal fetal growth and risk of late stillbirth: findings from the Auckland Stillbirth Study. ANZJOG 2012;52:242–7. Key Performance Indicator report—Q2 2010/11; West Midlands Perinatal Institute 2011. http://www.pi.nhs.uk/pnm/maternitydata/Q2_2010-11_Perinatal_KPI_report.pdf (accessed 31 Aug 2013).
. Symphysis-fundus height and pregnancy characteristics in ultrasound-dated pregnancies. Obstet Gynecol 1999;94:591–4.
. An enhanced, midwifery-led ultrasound service to monitor fetal growth. Arch Dis Child Fetal Neonatal Ed 2013;98(Suppl 1):A1–112. Stillbirths in the West Midlands: 2011 Update. West Midlands Perinatal Institute 2012. http://www.pi.nhs.uk/pnm/clusterreports/2011/WM_2011_Stillbirth_Update_Sept_2012.pdf (accessed 31 Aug 2013).
. National, regional and worldwide estimates of stillbirth rates in 2009 with trends since 1995: a systematic analysis. Lancet 2011;377:1319–30.
. A global reference for fetal-weight and birth weight percentiles. Lancet 2011;377:1855–61.
. Fetal growth standards: individual and global perspectives. Lancet 2011;377:1812–14. Gestation Network. Gestation Related Average Weight (GRAW) v1, 2010. http://www.gestation.net/fetal_growth/graw/ (accessed 31 Aug 2013). Contributors All authors had full access to the data, assisted with its analysis and interpretation of the results, and reviewed and approved the final manuscript. JG wrote the paper, has final responsibility to submit for publication, and is the guarantor. Funding All staff were financially supported during the period of the study by NHS West Midlands Strategic Health Authority and Primary Care Trusts. Competing interests All authors work for the Perinatal Institute, a not-for-profit organisation which supports the provision of customised growth charts and runs training workshops in fetal growth assessment.